RIO DE JANEIRO, BRAZIL – Following rugby’s 92-year Olympic absence, history was made on Monday, August 8th, as Australia’s women’s rugby team became the first team ever to win a women’s rugby gold medal. After falling behind to fellow rugby powerhouse New Zealand, the Aussies stormed back for the historic 24×17 victory, outscoring the Kiwis four tries to three with two tries coming while New Zealand was a player down. Australia’s women’s rugby sevens team took down New Zealand 24×17 to win the first ever Olympics women’s rugby gold medal, photo courtesy of New Zealand Olympic Committee. The gold medal match, held at Deodoro in Rio’s Zona Norte (North Zone), started strong for New Zealand with Kayla McAlister scoring the team’s first try. The Australians responded with a controversial try from Emma Tonegato, who appeared to fumble the ball as she dove into the corner. After the referees reviewed the play, the try was awarded, tying the game. The turning point of the match came literally seconds before halftime when one of the women’s game’s biggest stars, New Zealand’s Portia Woodman, was sent to the sin bin with a yellow card. Australia quickly exploited the player advantage scoring with a try from Evania Pelite right before halftime. With Woodman still forced to remain on the sidelines for the start of the second half, Australia wasted no time to take advantage when Ellia Green ended up scoring a converted try on the vacated right wing where Woodman would have been. Another breakaway score from Charlotte Caslick, gave the Aussies a nineteen point lead with four minutes left, all but sealing the victory for Australia. Despite a late rally with two tries, a second try from McAlister and another from Woodman, the New Zealand comeback would fall short forcing the team to settle for silver. In the bronze medal game, Canada defeated Team GB 33×10 avenging its earlier group play loss, photo by Mark Blinch/Canadian Olympic Committee. In earlier action, Canada avenged its previous 22×0 group play drubbing at the hands of Great Britain by beating Team GB 33×10 in the bronze medal game, denying Team GB an Olympic medal. Similar to the gold medal game, minutes before the half, British indiscipline proved costly as team captain Emily Scarratt instinctively reached out to block a pass to earn a two-minute trip to the sin bin for the knock-on. With Team GB down a player, Bianca Feralla scored easily driving right into the heart of the now fragile British defense. Minutes later, Kelly Russell scored again for Canada for a total of fourteen points scored with Scarratt on the sidelines. Two desperation tries by Jasmine Joyce and Danielle Waterman in the second half would prove too little too late for Team GB who were worn down by Canada’s physical play. 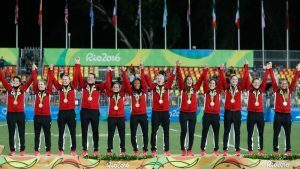 Along with Australia, New Zealand, and Canada, winning gold, silver, and bronze respectively, the inaugural Olympic women’s rugby sevens competition also included the U.S. placing fifth, and host country Brazil finishing in ninth place. Rugby sevens is designed to be a faster, slimmed down version of rugby, with only seven players on the pitch compared to the typical fifteen. Rugby was last included in the Olympics at the 1924 Paris Games in men’s competition only. The Olympic rugby sevens men’s competition kicks off on Tuesday, August 9th, with twelve games starting with Australia facing off against France, Great Britain meeting Kenya, and the U.S. competing against Argentina.